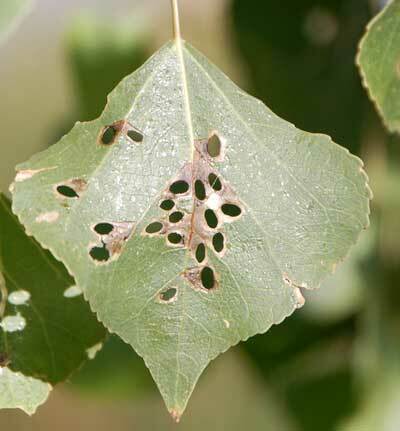 Fremont Cottonwood (Populus fremontii) leaf with holes produced by larvae of a Coptodisca moth. Observed at Tres Rios Wetland, s.w. Phoenix, Arizona, Sept 24, 2009. 'sp.' means the specific species of moth is not determined, but most likely is a member of the genus, in this case Coptodisca. Leaf miners of many, many kinds live in the Sonoran Desert as in many habitats around the World. They include flies, beetles, wasps and moths. Both the adults and larvae are very small and often dorsal-ventrally compressed (flattened) so as to be able to tunnel between the upper and lower cortex of a leaf. Once the larva has eaten away the soft, nutritious center a translucent tunnel in the leaf can be seen. Heliozelid moth larvae, when they are fully grown and ready to pupate, cut the perimeter of the tunnel and form a case in which to undergo metamorphosis. The case drops out leaving a smooth oval hole. Thus, in the leaf at left, each hole represents a single, very small moth having fed on the leaf and completed pupation. Normally these insects are very scarce ... one would have to search many leaves to find maybe one leaf mine. Some trees would not have any. The abundance of these leaf mines along the Salt and Gila Rivers in Maricopa Co., Arizona, is a result of mosquite control efforts! In a natural, balanced ecosystem leaf miner populations are held in check by even smaller organisms (usu. wasps) that are known as parasitoides. Like the flea hath fleas, even nature's smallest creatures have smaller still adverseries. Once poisonous chemicals are fogged into the environment the tiny wasps that were so busy parasitizing the heliozelid caterpillars within their mines are killed off. Being confined within a leaf the moth larvae escape the poison and then are not parasitized. They are thus 'released' from their natural, biological control and a population explosion ensues. A leaf with one, two or three mines is still viable and usefull for the tree, but one with dozens of mines becomes a drain on the economics of the tree's photosynthetic business. The leaves are shed and the tree regrows new leaves, which are further mined. Just when the parasites are returning to rescue the grand cottonwoods from so many miners the fogging trucks return and wipe out the wasps and perpetuate widespread defoliation. This scenario, so often created by people, is a kind of pesticide treadmill, a secondary pest that becomes a problem only after spraying for a target pest.